Supplementary Retirement Scheme (a.k.a. SRS) is not strange to most Singaporeans. It is a deferred tax scheme which helps you save for the future while reducing your tax expenses now. If you are mid to high-income earners, SRS is a great way to save tax in addition to CPF top-up tax relief. For example, if your tax bracket is 15% and you contribute $10,000 to SRS, your personal tax is reduced by $1,500. The problem is that many people are overjoyed with the tax savings and they stop there. Do you know SRS interest rate is only 0.05% for funds idling in the account? Your one-time tax savings will be eroded over the years by inflation. How can you enhance the return of your SRS funds? What instruments can you invest using SRS? In this article, I will explain to you what SRS investment products and options are there. SRS was introduced in 2001, it complements the CPF Retirement Sum scheme to help people working in Singapore build up their nest eggs and obtain some tax relief at the same time. You can read my article “All you need to know about SRS” for more details about the scheme. To enjoy the tax savings, you need to open an SRS account with one of the local banks, i.e. DBS, UOB and OCBC. Recently, one of my clients opened SRS investment account at a local bank. Somehow the relationship manager gave him the impression that he must use his SRS to buy one of the unit trusts from the bank to enjoy the tax savings, and he ends up paying a hefty sales charge for that! The truth is that you don’t have to. There is a wide range of options that you can choose from. I will talk about it later. Should You Invest Your SRS Funds? Contributing SRS and leave it uninvested is like buying a new car and leave it in the carpark. You get a one-time delight of owning a shiny gadget, but the car is worth less every day. 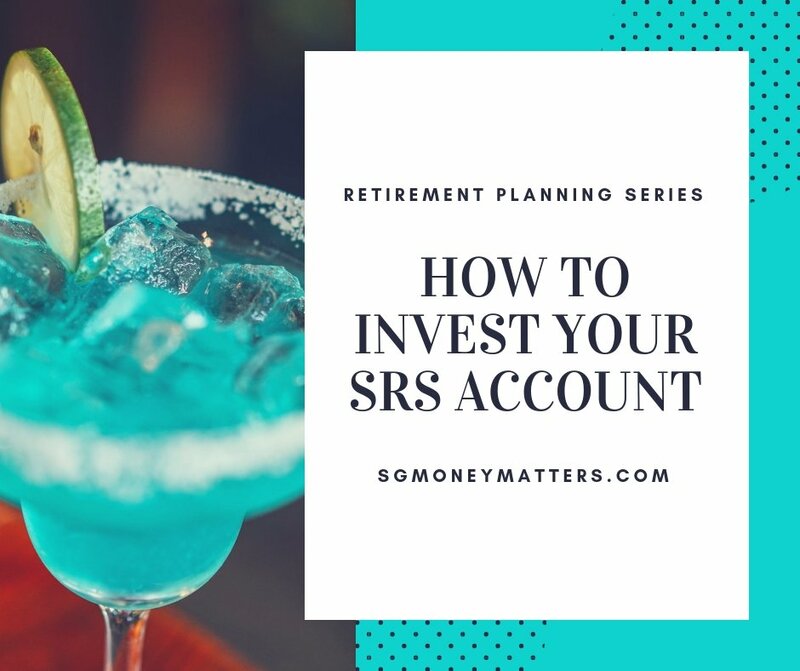 Unfortunately, many people are not aware of how they can enhance the return of their SRS funds. 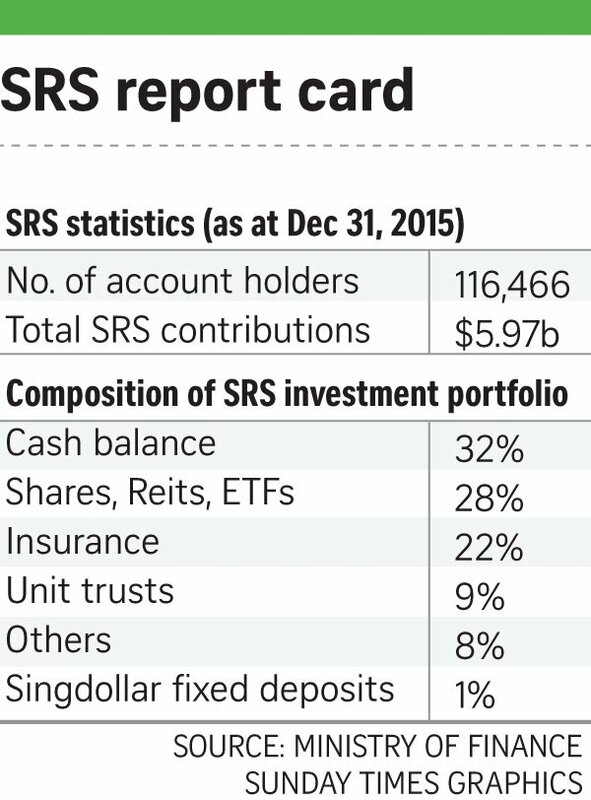 According to an article from the Straits Times, 32% of $5.97 billion SRS funds are lying idle as cash. That is more than $1.9 billion of Singaporeans retirement funds. Why you should invest your SRS money? Potential higher returns: if you leave your SRS money with 0.05% deposit return, you are not taking care of your own retirement. Even if you leave it to a time deposit or an insurance policy, you earn multiple times higher return. Besides, you can invest in funds, ETFs, shares and REITs. Since you have a long investment time horizon, it is not difficult to earn a reasonable return. Non-taxable investment gains: Any gains realised on your investments are not subject to income tax before withdrawal. Singaporeans sometimes take this for granted. But for many foreigners, this is dreams come true. Ability to withdraw SRS in the form of investment: If you have accumulated a sizeable investment portfolio, you may not want to sell them when you retire. The good news is that, from July 2015, SRS members can withdraw an SRS investment by transferring the investment out of their SRS accounts, without having to liquidate them. What Can You Invest Using Your SRS Funds? I will go deeper into this. Investing can be intimating to first-time investors. But you don’t have to jump to the wagon straightaway. If you are extremely conservative, you have the option to invest into Singapore Government Securities (SGS), and the government has allowed Singaporeans to use funds from their SRS account to buy Singapore Savings Bonds (SSB) with effect from December 2018. But I must caution you that retail bond investment market in Singapore is still immature. Retirement income insurance is a kind of Retirement Plans that pays you Guaranteed Income when you retire. It goes hand-in-hand with the SRS structure. 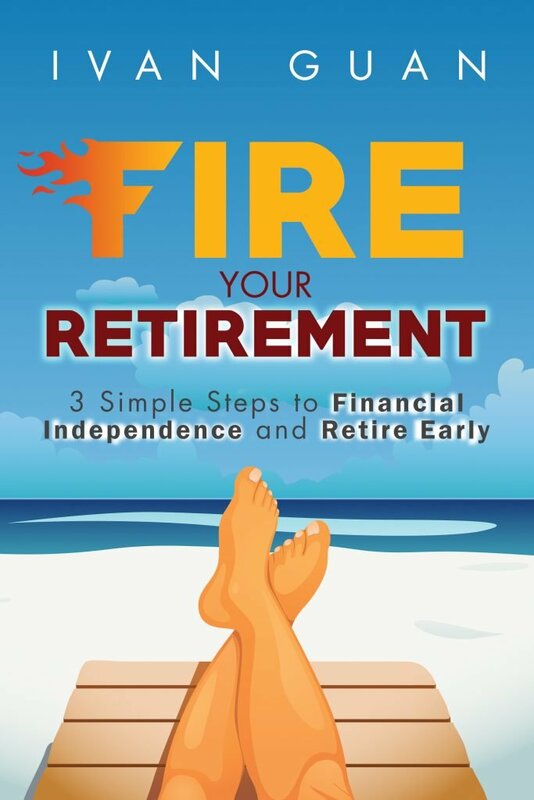 Click here to read my earlier article about how Retirement Income Plan works. The target return of an insurance product is around 3% to 4% per year. The other advantage of an insurance plan is that such plans are protected under the Policy Owner Protection scheme. If the insurer goes bust, up to $100,000 guaranteed benefits are protected. Plans can allow for a contribution continuation feature/benefit upon disability. Trust nomination is not allowed for life insurance products purchased using SRS funds. If you have more questions about these plans, leave your comment below and I will answer them. If you want to receive a lifetime payout instead of a defined payout period, you can consider annuity plans. The annuity options in Singapore are very limited. There are only a few plans available now. You should not forget SRS is not a tax exemption scheme, but a tax deferment scheme. It means when you receive your insurance payout when you retire, you could be subject to income tax. The insurance need not mature at the prescribed retirement age. But if you purchase a life annuity, you will be taxed on 50% of the total annuity payouts each year, for as long as the annuity payouts are received. Currently, you have up to 10 years to withdraw your SRS after statutory retirement age or the date of first withdrawal. You should also take note that you are not allowed to surrender an annuity policy after the SRS account has been closed or deemed closed. If your SRS account is still open, your monthly annuity payouts must be returned to the SRS account before you withdraw them. If your SRS account is closed, your monthly annuity payouts may be paid into your bank account directly. Typically, the insurance option is more suitable for a person who is approaching retirement age and has a substantial amount in their SRS. If you are just starting to contribute SRS, you should consider investing. SRS investment is a big topic which I will just touch briefly in this article. Feel free to leave your questions below and I will talk about them in more details in the future. If you just open your SRS account, the bank relationship manager will show you a few “approved” funds. What they show you are just the funds distributed by the bank. In fact, there are more than 600 SRS approved funds in Singapore. Many people have a misunderstanding about unit trust. I recommend you to read my earlier article “how to dig below the sales pitch and choose the right unit trust”. As a start, you need to know what funds are available. Here is how you can check them out. Select “SRS available” under CPF/SRS? You will get the whole list of SRS eligible funds. You can also choose to invest stocks using your SRS funds. To do so, you need to contact your stock broker to update your SRS Investment bank account details. After the linkage has been established, you will need to select the option “SRS” under “trade type” to conduct an SRS stocks trade. Please note “Contra” is not available for SRS trades. You can use SRS to buy most of the individual stocks and real estate investment trusts listed in SGX, but I discourage you to do so. Why? Individual stocks and REITs are subject to corporate actions, and it can get quite complicated when you are not investing with cash. For example, if a company issue rights, you need to top up to prevent your shares from being diluted, but you may not have enough SRS balance or you may not be able to top up if you have maximized the yearly limit of SRS contribution. Nevertheless, if you really want to invest in shares, there are some options available. Some brokers will handle the corporate actions (though not in a perfect way) for you, you need to check the terms of each investment account. Also, bear in the mind the brokerage fee is not attractive for small investment accounts. My opinion? Most retail investors are better off to invest in funds and ETFs using SRS account. Earlier on, I highlighted the tax issues of using SRS to purchase insurance. If you use SRS to invest, all proceeds from the sale of your SRS investments will be returned to my SRS account. The tax will be imposed on the amount subsequently withdrawn from the SRS account. The amount in the SRS account will be deemed to be withdrawn immediately after the end of the 10-year withdrawal period, and 50% of the balance will be subjected to tax. Generally, shares and unit trusts in Singapore adopt one-tier exemption system. It means dividend distributions from unit trusts and shares purchased with SRS funds and deposited into the SRS account are not taxed. We have covered a lot today. It may sound hard for you to grasp all these options. But one thing is for sure, you should not leave your SRS account idling. As a licensed independent financial adviser, I helped my clients evaluate and review their SRS investment options and recommend investment portfolios that suit their needs. I manage a proprietary Global Momentum Compass Portfolio which uses SRS eligible investment instruments and delivers consistent returns. The advantage of taking the advice from an independent financial adviser is that your options are not limited to what the bank sells and you can plan your retirement in a holistic way. If you want to find out more, I offer a non-obligatory retirement discovery meeting to show you the options to enhance your SRS returns. Simply submit your request below for an appointment.